Russian tanks have entered Georgia's breakaway region of South Ossetia, says Georgian President Mikhail Saakashvili. Georgia has been fighting separatists with ties to Russia in order to regain control of the province, which has had de facto independence since the 1990s. Russian troops in the South Ossetian capital said their artillery had begun firing at Georgian forces, Russian news agencies reported. Russia's president earlier promised to defend his citizens in South Ossetia. Moscow's defence ministry said more than 10 of its peacekeeping troops in South Ossetia had been killed and 30 wounded in the Georgian offensive. At least 15 civilians are also reported dead. 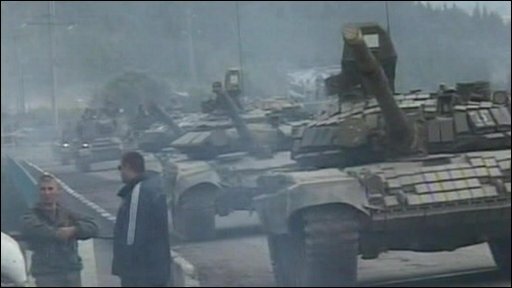 Amid international calls for restraint, Georgia's president said 150 Russian tanks and other vehicles had entered South Ossetia. He told CNN: "Russia is fighting a war with us in our own territory." 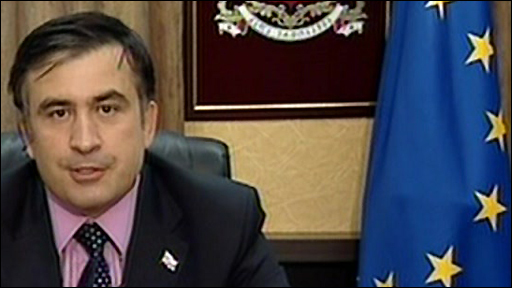 Mr Saakashvili, who has called on reservists to sign up for duty, said: "This is a clear intrusion on another country's territory. "We have Russian tanks on our territory, jets on our territory in broad daylight," Reuters new agency quoted him as saying. Later, Moscow's foreign ministry told media that Russian tanks had reached the northern outskirts of the South Ossetian capital, Tskhinvali. The Georgian interior ministry said Russian jets had killed three Georgian soldiers at an airbase outside the capital, Tbilisi, during a bombing raid on Friday, Reuters news agency reported. Russia denied any of its fighters had entered its neighbour's airspace. Moscow's defence ministry said reinforcements for Russian peacekeepers had been sent to South Ossetia "to help end bloodshed". Amid reports of Russian deaths, President Dmitry Medvedev said: "I must protect the life and dignity of Russian citizens wherever they are," Interfax news agency reported. "We will not allow their deaths to go unpunished. Those responsible will receive a deserved punishment." Russian Foreign Minister Sergei Lavrov said Moscow was receiving reports that villages in South Ossetia were being ethnically cleansed. 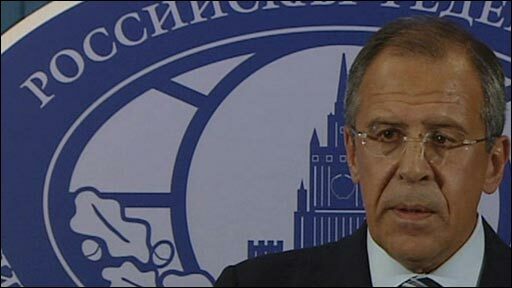 Mr Lavrov added in televised remarks: "The number of refugees is growing. A humanitarian crisis is looming." Russia said it would cut all air links with Georgia from midnight on Friday. Meanwhile Interfax quoted South Ossetian rebel leader Eduard Kokoity as saying there were "hundreds of dead civilians" in Tskhinvali. Witnesses said the regional capital was devastated. Lyudmila Ostayeva, 50, told AP news agency: "I saw bodies lying on the streets, around ruined buildings, in cars. It's impossible to count them now. There is hardly a single building left undamaged." US President George W Bush spoke with Russian Prime Minister Vladimir Putin about the crisis while they attended the Beijing Olympics. Later, the US voiced support for Georgia's territorial integrity and its state department said it would send an envoy to the region. Nato said it was seriously concerned about the situation, while German Chancellor Angela Merkel called on all sides to show restraint. The European security organisation, the OSCE, warned that the fighting risked escalating into a full-scale war. Georgian Foreign Minister Ekaterine Tkeshelashvili told the BBC it wanted to ensure that any civilians who wanted to leave the conflict zone could do so safely. International Red Cross spokeswoman Anna Nelson said it had received reports that hospitals in Tskhinvali were having trouble coping with the influx of casualties and ambulances were having trouble reaching the injured. Georgia accuses Russia of arming the separatists. Moscow denies the claim. Russia earlier called an emergency meeting of the UN Security Council to respond to the crisis, but members failed to agree on a Russian statement calling on both sides to renounce the use of force. The BBC's James Rodgers in Moscow says Russia has always said it supports the territorial integrity of Georgia but also that it would defend its citizens. Many South Ossetians hold Russian passports. Hundreds of fighters from Russia and Georgia's other breakaway region of Abkhazia were reportedly heading to aid the separatist troops.